I always knew that allowing just one day in Berlin would be a dumb idea so we almost didn't make the trip (from Würzburg) at all, then at the last minute decided better to have gone for a day than not go at all! I'm so pleased we did though because we had a ball. Hiring bikes, we wouldn't have seen anywhere as much of this interesting city otherwise. We made a full day tourist itinerary which traversed the city several times, Berlin is really great for cyclists isn't it? That KaDaWe place should come with a health warning though — we got sucked in there, and couldn't escape. 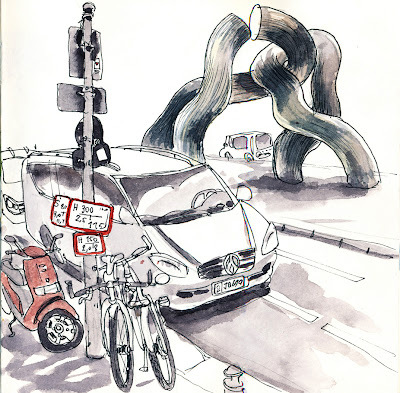 Amazing place, (we don't have one of these in New Zealand) but we had to drag ourselves away so I could draw the ‘Berlin’ Sculpture on Tauentzienstraße outside. 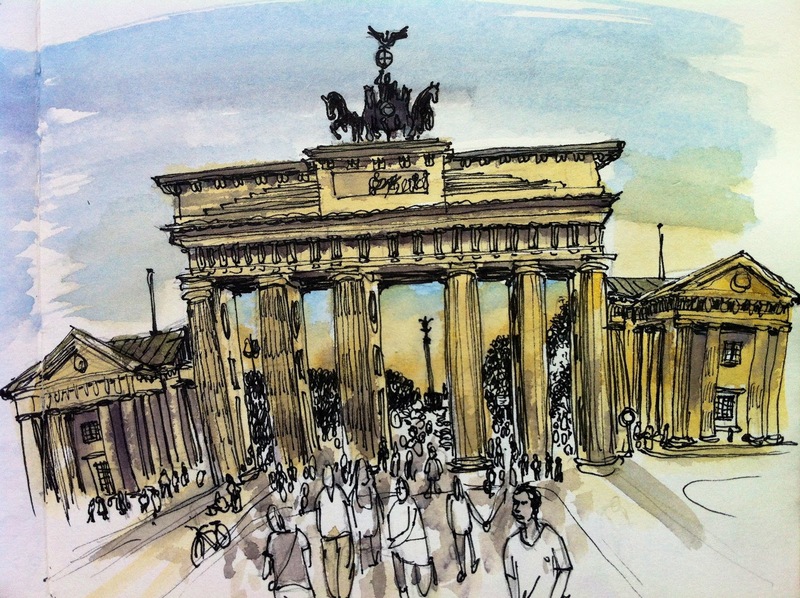 Eventually we made our way through the Brandenburg Gate again as the sun went down to meet Rolf who at short notice suggested we meet at the excellent Schleusenkru biergarten, a very pleasant meeting and our day ended with us winding through the city back to our hotel. There is of course much much more to see, not all tourist sights, but that will have to wait until next time, when I hope to meet more sketchers. 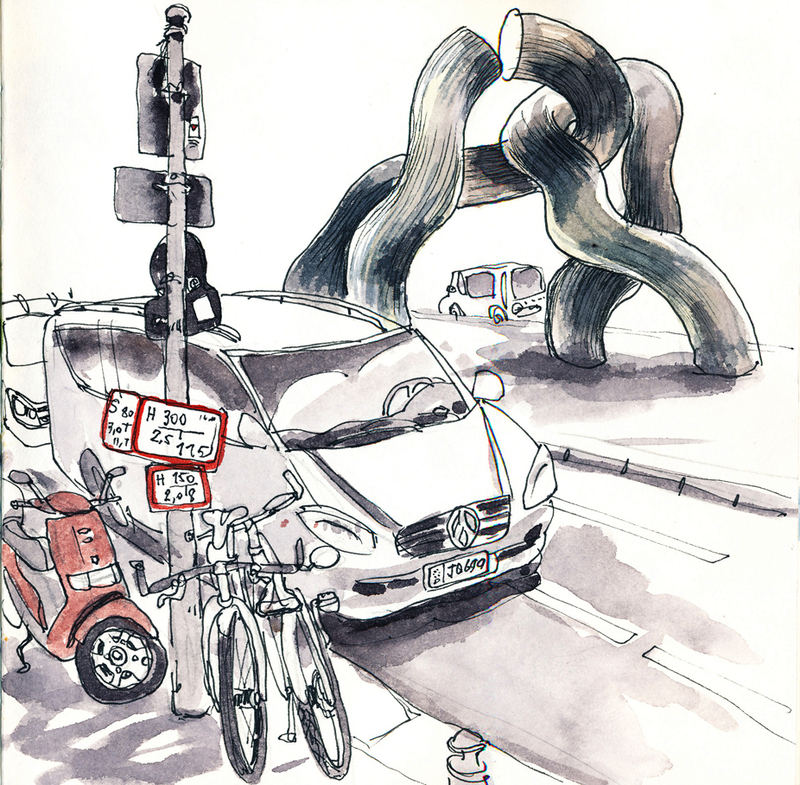 think, your cycling tour was the perfect concept, to get as much of berlin as possible in a day - you even managed to do beautiful sketches. like these elements seen through structures, car in top drawing and siegessäule below - simple and effectifly providing deep space.